Buying pre-made organizational storage can add up to big dollar amounts by the time everything is exactly where you want it to be. There are ways to get around the burden of being organized, however – and we’re here to share some of those ways with you. Give these out of the box approaches to repurposing existing possessions in order to improve your home organization a try and see how they work for you. Plus, who doesn’t love a fun DIY project? Don’t throw out your old shutters – use them as a repurposed document organizer. Think about an old shutter on the outside of your house. They’re big and unwieldy and when you’re done with them what else is there to do but throw them out, right? Wrong! Take an old shutter, clean it up, paint it and mount it on the wall. Suddenly you have a shabby chic mail or paper organizer. By tucking mail and other documents in the shutter’s slats you now have a cool, fun organizational conversation piece. Ice cube trays can have a second life. Everybody has a junk drawer that’s filled with years of household nonsense and ephemera. They’ve always been near impossible to organize – until now. Repurpose unused ice cube trays as an easy way to organize drawers into easy to find sections like paper clips, rubber bands, and the like by placing them in the tray’s different cubed sections. Turn old luggage into creative storage-friendly end tables. Have any old suitcases or hand-me-down luggage lurking in your basement? Give it new life by gluing a couple short legs onto the bottom and voila – you now have an interesting end table that can double as extra home storage. Tension rods are for more than just curtains. They can be used under the sink for easy access cleaning bottle hanging. They can be used as a quick fix laundry drying rack. They can be used as simple storage for crafting supplies like spools of yarn, tape, or ribbon. The possibilities are endless! Never throw out old picture frames. Add a couple hooks and some paint to an old picture frame and suddenly you have a brand new jewelry organizer. Mount a piece of corkboard on the back of an old frame and now you have a great place to store important notes or documents. You can always take a bunch of them, glue them on top of one another to create a stylized box and use that for magazine or nonsense storage. 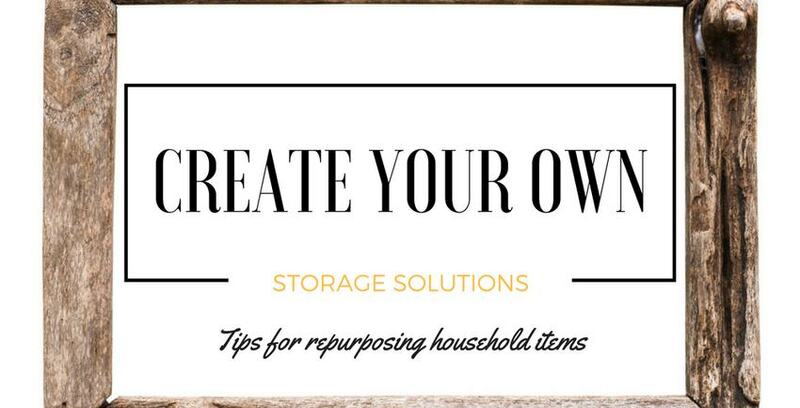 There are dozens, hundreds, millions of ways to take existing household items and give them new life as organizational and storage devices. When your existing storage isn’t quite enough to cut it, that’s when Storage Direct and our huge variety of storage units come to save the day.